This issue is packed with important updates concerning regional campaigns. The Idaho Rivers United lawsuit is fast approaching, an important hearing regarding mining claims on the N. Fork Clearwater is next week, we have an update about the Friday Minerals Mining Exploration Project, the Army Corps of Engineers wants to keep dredging the lower Snake, the Idaho Transportation Department wants to realign US 95 along the base of Paradise Ridge, and the Idaho Fish & Game Department wants to kill even more wolves. Plus, we welcome our two newest interns. 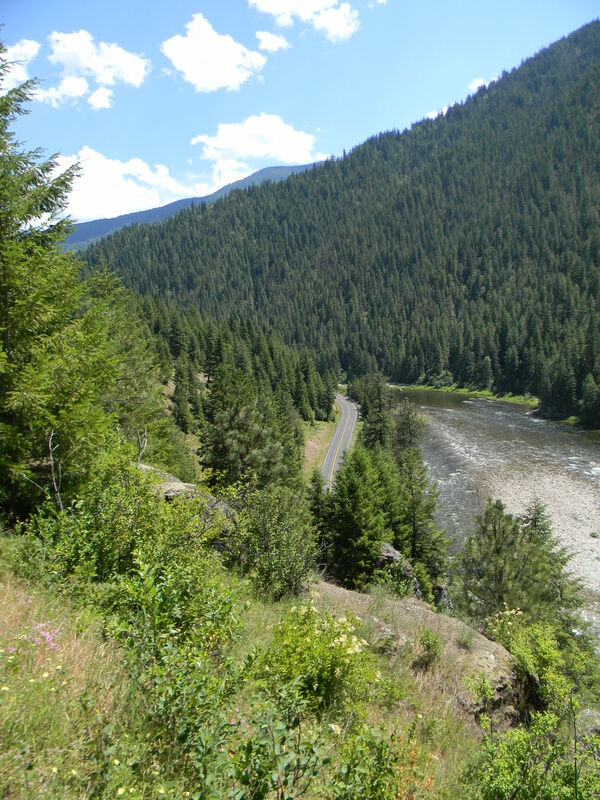 With the continued abuse of US 12 by megaload transports, there is much at stake in the upcoming Idaho Rivers United vs US Forest Service lawsuit. On Wednesday February 6 at 3:30pm, Advocates for the West will be arguing before Federal District Judge Winmill that the Forest Service has the authority to enforce federal laws within the Wild & Scenic river corridor. Advocates is also arguing that the Federal Highway Administration (FHA) has the authority to enforce federal highway transportation laws. The FHA is a co-defendant in the case. Learn more. If you are interested in carpooling down to Boise for the court case, please contact us at (208) 882-9755. We realize winter conditions may prevent some of us from attending. Oral arguments will be at at the James A. McClure Federal Building & US District Courthouse, which is located at 550 W. Fort Street in Boise. Dozens of placer mining claims have been filed on the North Fork Clearwater River this past year. The Forest Service intends to challenge mining on those claims next week before a US Department of Interior administrative law judge. Unlike the archaic Mining Act of 1872, the federal government is permitted to prohibit these claims under the Mining Rights Restoration Act of 1955, which the N. Fork Clearwater falls under. The Forest Service recommends the N. Fork Clearwater for wild & scenic River designation. It is a world-class blue ribbon fishery, a major destination for camping and other recreational pursuits, and also contains critical habitat for bull trout. We fully support the Forest Service in their efforts to prohibit mining on the the claims. A total of 36-claims have been filed between the mouth of Weitas Creek and Aquarius. FOC has filed an administrative appeal of the decision to allow the Friday Minerals Mining Exploration Project to begin on the S. Fork Clearwater. Water quality and anadramous fish habitat are major concerns of ours. The Army Corps of Engineers has released a Draft Environmental Impact Statement for their Programmatic Sediment Management Plan. The agency wants to dredge the shipping channel near the Clearwater and Snake River confluence, as well around the Port of Clarkston and Port of Lewiston. The plan also retains raising levees near Lewiston as a potential tool in the future to deal with the continued accumulation of sediment behind the Lower Granite Dam. A public hearing has been announced for Thursday January 24, but we are waiting for the agency to choose a time and place. We will keep you updated. View the plan. The Idaho Transportation Department has announced their plans to pursue the E-2 alternative for the potential 6.5-mile re-alignment of US 95. E-2 would move the highway from its current roadbed near Thorn Creek and take it northeast along Paradise Ridge, before heading northwest and joining the current roadbed just south of the Moscow city limits. The department is taking public comments on their Draft Environmental Impact Statement on Wednesday February 23 from 2:00-8:30pm at the University Inn Best Western in Moscow. The Paradise Ridge Defense Coalition has reformed to oppose the E-2 alternative. On Thursday January 17, the Idaho Fish & Game Department is having a public meeting in Boise at their Fish & Game Headquarters, which is located at 600 S. Walnut Street. The agenda includes a proposal to transfer $50,000 to “supplement wolf control efforts in areas where elk herds are in decline.” It’s possible the department will use this money to kill more wolves via aerial gunning. Fourteen wolves were killed in the Lolo Zone in February by helicopter-gunners. On a positive note, we would like to welcome Washington State University student Noah Hoff and University of Idaho student Reba Eggert as spring interns. Welcome to the A-Team!